Mulberry Beaded Hem Shift Dress is rated 4.8 out of 5 by 4. 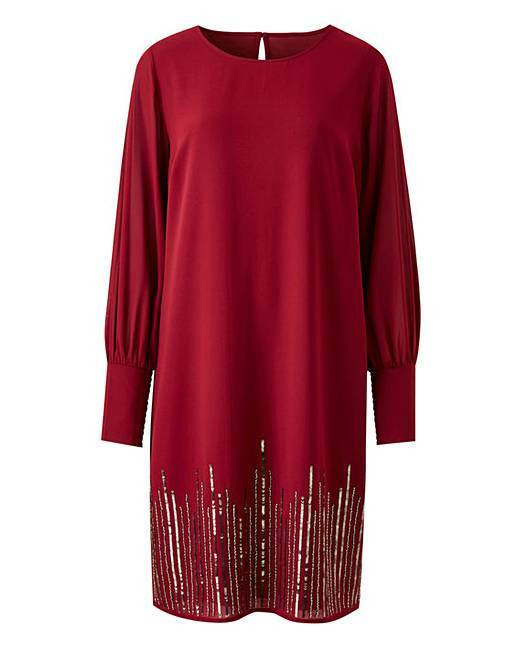 Bringing elegance into your evening wardrobe with its delicate cuffed long sleeves and a gorgeous beaded embellished hem, this fully lined dress is truly stunning and suitable for all special occasions. Pair with some cute strappy heels to complete the look. Rated 5 out of 5 by JillyG from Beautiful This is the perfect dress for all my Christmas parties and new year. Figure slimming and comfortable to wear. Rated 5 out of 5 by Welsh lady from Beautiful dress I bought this dress for xmas day , the first one i bought was too big so i sent it back, no hassle returns and a smaller size was sent out immediately , refund was sorted very quickly, the dress is beautiful and true to suze.